This post has been inspired by the upcoming tickets Emily and I have for the James Island County Park Starlight Yoga . It takes place in the center of the Holiday Festival of Lights , this Wednesday, December 9th. Tickets will still be available at the gate, if you're interested! When I first moved to Charleston about five years ago (I can't believe that it's been that long! ), I was surprised at how many yoga studios I saw around town. You name it, it was here; Community yoga, Baptiste yoga, Bikram yoga, Prenatal yoga, Vinyasa yoga, Hot yoga, Ashtanga yoga, Jivamukti yoga...and the list goes on. Before moving here, I had really only practiced yoga at my regular gym, as part of cooling down after a hard cardio workout. I was curious to find out what all of the hype was about. Since I was new to the area, didn't know anyone, and seemed to have plenty of time on my hands (I'm not a big fan of socializing as a party of one), I decided to try it out. I started with a Groupon for Charleston Power Yoga. After that first class I couldn't decide if I was hooked or going to die, but one thing was for sure, this wasn't my old gym's afterthought of a yoga class! I think that we must take the time to pause and take a big breath during this hectic time of year. Yoga helps to keep the soul centered. There truly is something magical about being forced to stop and concentrate on your breath. Being pregnant, I have found a great solace in my prenatal yoga practice (Holy Cow Yoga has a great class). As my body is changing and I'm anxious about becoming a parent, I find some peace in laying it all out on my yoga mat. So much of living in the Lowcountry and the lifestyle here can be centered around the beauty of the environment that surrounds us everywhere. I was at a complete stop in some traffic last week and began to be frustrated, thinking about everything on my 'to-do' list, when I looked up and just took a minute to breathe. The view was amazing. 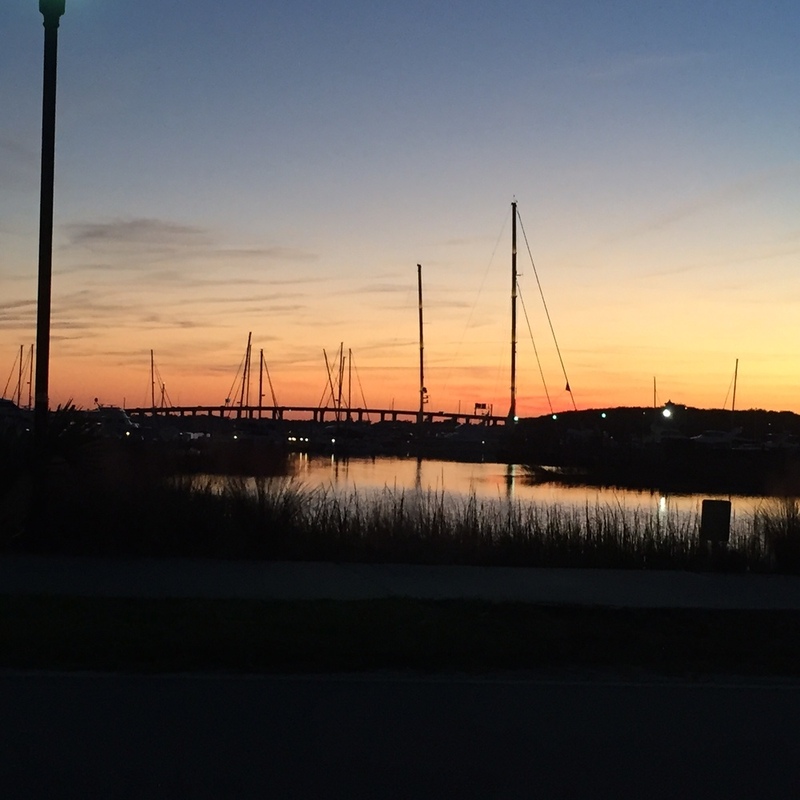 It's crazy how no matter where you are here (with a few exceptions of course) that if you just take a moment to look up and breathe, you will be comforted by the beauty of the Lowcountry. View from my car while stopped last week. YogaPop - a whimsical night of yoga, live music, entertainment, shopping, and community fun held several times throughout the year! Charleston SUP Safaris offer SUP Yoga- basic paddleboarding instruction and a full-on water yoga class. Several paddleboarding companies around the area sponsor this type of yoga. Yoga at the Beach - Folly Beach Yoga with Serenity Tree Yoga instructors allow you to wiggle your toes in the sand, breath in the salty air, and connect to the relaxing waves of the ocean. Several of our beaches offer yoga classes such as these. Walk and Restore Yoga at McLeod Plantation - lead by yoga professionals, this restorative walk leads participants along short walking loops stopping intermittently to stretch, relax, and practice restorative yoga. Bendy Brewski- Yoga for beer lovers. A casual environment (read: local brewery) to enjoy an hour long class followed by a pint or flight. $15 pays for both. Class frequency slows down a bit through the winter, so always check their schedule for times and locations. East Shore Athletic Club- Where I should go more often, since I’m a member. Classes offered many times throughout the week, but I prefer the morning beginner class on Johnnie Dodds for a good stretch to start my day. Serenity Now- Yoga for all levels. This studio has a gorgeous mural on the wall that at the end of the day, centers me and takes away all of the day’s distractions. My friend Janeen and I find it easier to make it to this class during the winter nights, when our calendars aren't quite as full. Bikram Yoga- Hot yoga. If you’ve never taken yoga before, this may not be the place to start, but can be enjoyable, if you read up on everything you’re getting ready to experience; simple poses, high heat. Cautionary tale from yours truly, who did not do her research and ended up dehydrated and aching hours after exiting the class. Senior Center Yoga- Ok, so this isn’t one I've been invited to join, yet, but my Mother-in-Law attends frequently. If you ever saw her get up from the floor, with the same ease as a teenager with my one year old nephew, you’d be impressed at her flexibility and inspired to participate. Side note: Angela is always calling me her most 'hippie' friend and yet here she is talking about yoga, calmness, and peace. I love it. Looking forward to Starlight Yoga on James Island this week. Hope you can join!